Doesn't facebook sort of make you feel like some important person on your birthday...messages of birthday cheer popping in left and right! This will come as no surprise...I love my birthday and all birthdays in general because they seem to always involved C.A.K.E. 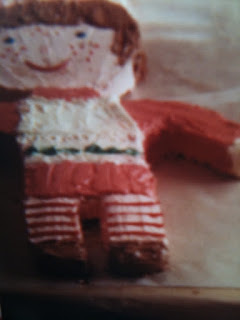 When I was a little girl, my Grandma N. would let me pick the birthday cake I wanted out of her special cake decorating book. I thought it was the coolest thing ever--until she told me it all ended when I turned 11. What? 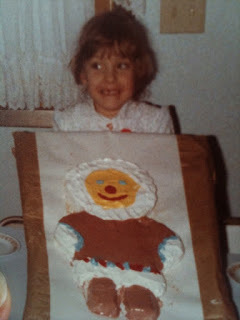 I cherished every special birthday cake. When she passed away, I got a little book where she had collected pictures of all of my birthday cakes. This one was my favorite, but I didn't make it into the picture! 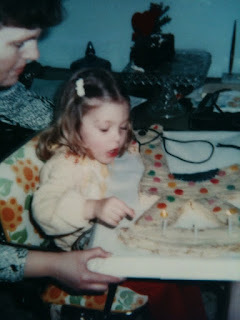 Enjoying my special birthday cake as a little girl was so fun! the cakes mean even so much more to me. I wish my grandma were still here so I could call her up and thank her for the special memories these cakes have made as I remember them and the special times with my family celebrating! Do you have a special birthday memory? Those pictures are so adorable! That's so sweet that she did that for you. I can totally see you doing that for your kids too. I don't have any extra special memories, but I just love everything about my birthday. Guess I'm kind of like a little kid in that way, huh? Happy Birthday! 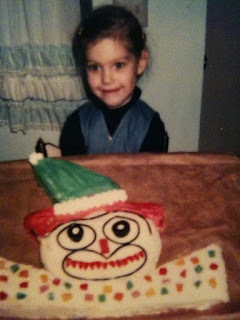 Sweet cakes - what a cute little Londa you were! And such a sweet grandma. I remember getting a Cabbage Patch kid for my birthday.....it was awesome, and then I realized it was a knock-off. My mom had made it for me. Funny. It was always my favorite though. Her name was Tabitha and I still have her (in the garage) and love her! Creepy story, huh?